"What takes the most courage is giving ones self completely to writing, the same way it takes courage to give one's self emotionally to another human being." 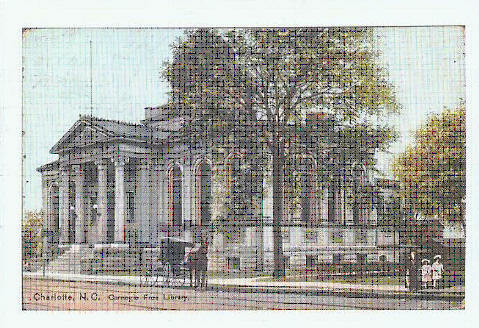 Charlotte Writers' Club was born during the spring of 1922 in the midst of the verdant beauty of North Carolina. Its mother and founder was Mrs. A.L. Kimball, who moved to Charlotte two years earlier from Lowell, MA. Mrs. Kimball lived on Morehead Street in the Addison apartments. "When I came to Charlotte, some eight years ago, my first question was 'Is there a writer's club?' When I found that there was not, and that so far as anyone knew, not even any writers, I felt a sudden sense of homesickness. I then decided to launch a writers' club, but first I must discover some writers or would-be writers. The simplest plan was to start a class in writing, and risk placing myself in the position of teacher. That was quite a presumptuous thing for an utter stranger to do, and the only reason I dared was because I had taught story writing classes in other cities, and had made the writing of stories my own life work." Laura Miller details the process Kimball went through from the notices she placed in the paper urging anyone interested in writing to meet with her, to the offering of a 10 lesson study course: "... she inserted in the papers a notice that she would be glad to have anyone interested in short-story writing, meet her at the Chamber of Commerce on such and such a night----I remember very clearly that it was an evening in early spring 1922. . ."
By September the short-story group had some "very encouraging letters" from magazine editors but no one had sold a story. Out of the short-story group, Kimball organized the Writers' club and Miller was a charter member. The only qualification for membership was a sincere interest in writing. Charter members of the club were Miss Willie Irvine Shelby (who soon after the club's beginning sold a story), Miss Mary Pressly, Mrs. Harvey Barrett and Miss Miller, along of course with Mrs. Kimball. A few years after the founding of the Club, Adelia Kimball left Charlotte, and despite exhaustive research by Dede Wilson in the late twentieth century, no information was found regarding Ms. Kimball's later whereabouts and career. Despite the shroud of mystery over her later life, Kimball's impact on writers in Charlotte has been luminous and enduring. "In those first days it was surprising to me that so many Charlotte men and women really were skillful writers. They had needed just the spur and the confidence which this club was able to give them. The mingling with other writers, the exchange of ideas, listening to other stories. "We openly have commercialized our work, writing mainly to sell, even while we all have kept a deep-seated and sincere love for all beauty in writing and in art. We haven't talked 'literature,' but we have kept our open appreciation of it. "We purposely have avoided entertaining celebrities, lectures or abstract discussions of any kind. We have had no club dues, no treasury. We have no minutes, no business of any kind. All we do, or want to do, is write, and discuss our own writing. "If we are a selfish club, at least we can work toward an unselfish end, the practical progress of authorship." Sometime in the mid-1920s, Mrs. Omera Denison wrote to an established writer in New York asking for advice on publishing her. The letter was forwarded to Paris, where the Unidentified New York writer had moved. When the response arrived, it said "The person who really proved of most help to me in breaking into the writing game was A. L. Kimball, of Lowell, Mass. If you will write her in care of Writecrafters, Inc., I think she could do more for you than anyone else." So, Mrs. Denison discovered that Mrs. Kimball was now in Charlotte, with the writer's club underway. Mrs. Denison quickly became a member. Under the prodding and guidance of Mrs. Kimball, she was soon selling her stories to McClure's Magazine. Another early member was Mrs. Hannah Black Butler, who wrote under the pen name of Merle Dana. In 1928, Mrs. Butler brought chapters from her novel to read to the group, while hiding from them the fact that she had already published four short stories. Two of her stories would appear in the annual anthology, American Short: Short Stories 1933, and two more in the 1934 edition. The novel she read to the group, The Second Son, was published in January 1937. "The Writer's Club of Charlotte is a literary organization which may be regarded as the nucleus of local effort in a great renaissance of literature in North Carolina, which in the last half century or more has spread like a wave through the proverbial radius, from Currituck to Cherokee, and continues to grow. This state-wide movement embraces a field which includes every range of thought from the altruistic, deep and earnest motives and efforts of the many who throughout North Carolina are devoting time and attention without recompense to the wiping out of adult illiteracy, to the most delicate shading of literary attainment as accomplished by cultured schools." Despite Mrs. Kimball's assertion that "All we do, or want to do, is write, and discuss our own writing," the club held a short story contest in 1927. J.H. Boyce, of the Observer staff, for his dialect story, "Rags and Bones," won the prize of $25. Boyce would become president of the club in 1936. In 1928, Mrs. R.A. Dunn offered to fund the $25 prize for the best short story by a member; the stories were to be submitted to a committee of judges chosen by Mrs. Dunn. Thus the Club launched its long tradition of contest sponsorship. Presidents: 1921-1928, Mrs. A. L. (Adelia) Kimball, founder. 1928-1935, unknown. Dr. Drachmas Brenizer was president for the 1935-36 term. Dr. Brenizer was president for the 1935-36 term but the transition from Mrs. Kimball to Dr. Brenizer is murky. No records for the years 1927-1935 are available. During his term, Dr.Brenizer was writing a mystery novel and would read a chapter to the group each week; members kept returning to hear what would happen next. The club was meeting every Tuesday night at the Public Library. J.H. Boyce followed Dr. Brenizer as president the following year. In 1932, Mrs. Edna Wilcox Talley, an early member of the club, organized the North Carolina Poetry Society. Kincaid Brockman was its first president. At the time, the North Carolina Poetry Society was located in Charlotte, and the CWC and the North Carolina Poetry Society joined resources for some events in what was jointly called The Charlotte Writer's League. The League held a banquet every May. For many years, the histories of the two groups are intermingled, and as late as 1954, Mrs. Paul Bartlett was president of the CWC while her husband was president of the North Carolina Poetry Society. Throughout the 1930s the Club held meetings, hosted the joint annual May banquet, and continued to sponsor contests. The meetings were often critique groups, but also included guest speakers. Thus, the general format of Club activities, as it functions today, was well established during 1930s. A curious lacuna in the historical account pertains to whether the weekly meeting format was only during Dr. Brenizer's term, due to the unfolding suspense of his mystery novel, or whether weekly meetings were the norm for the entire period. Presidents: 1935-1936, Dr. Drachmas (Chase) Brenizer; 1936-1937, J. H. Boyce; and 1937-1939, Mrs. Harold (Naomi) Hintze. "I know now, in my twilight years, that had it not been for the Charlotte Writer's Club and for Bernadette Hoyle's Tar Heel Writers' Roundtable, my work would have never made it to the pages of the national publications and the books in which it appeared. For that I shall be eternally grateful." Mr. Jack McLarn, a Southern Railroad executive, became a member in the early 1940s. He left Charlotte in 1956, but returned and resumed membership in 1968. He was president in 1947 and served two terms. Mr. McLarn, who wrote pulp fiction under a pseudonym, once published a story about "his" baby born out of wedlock. The story was so convincing two people wrote him wanting to adopt the baby. Late in life Mr. McLarn reflected on his writing career and acknowledged the powerful support of the Charlotte Writers' Club. Support of writers and writing has been the fundamental mission of the Club throughout its history. During the 1940s contest sponsorship continued. The Club's first trophy was a cup awarded for a state-wide short story contest. The first winner, in 1930, was charter member Laura Burton Miller. In 1931, the cup was won by an unknown writer, Marian Sims, who would soon become so well known her second novel, "The World with a Fence." Published by J.P. Lippincott company, would go into a second printing before it was published. This cup, donated by Mrs. R.A. Dunn, was eventually engraved with 33 names, one for each year from 1930 to 1963. The cup was given to the Mint Museum in 1963. The Sullivan Bowl, given by Mrs. W.B. Sullivan in memory of her husband, Charlotte Observer publisher Walter Sullivan, replaced the silver cup. The original Sullivan Bowl was presented to Elizabeth Simpson Smith after her name had appeared on it three times. Walter Lineberger, grandson of Mrs. Sullivan, gave a second Sullivan Bowl to the club. It, in turn, was later replaced by the Virginia Christenbury Bowl, given in her honor by her many devoted students. Although trophies, bowls and plaques are things of the past, CWC still honors past writing achievements. Currently, the Club sponsors an annual short story contest named after Elizabeth Simpson Smith, the remarkable recipient of the original Sullivan Bowl. "In Germany today, there is not a single first-class writer left, and there will not be one there until the Nazis are driven out. Since the writer by nature is a liberal and since he is logical because, his first interest is men and women, and since by nature he is a self-trained psychologist and detective, he is extremely dangerous and he has within his hands one of the world's most effective weapons and the written word." Presidents: 1939-1941, Miss Isabelle Baker; 1941-1943, Mrs. William Bain; 1943-1945, Mrs. Reginald Bell; 1945-1946, Miss Claudia Howe; 1947-1949, and Mr. Jack McLarn. The records give almost no information about the 1950s except to say that in May 1955, "the youthful Doris Betts" was speaker. Presidents: 1949-1951, Mrs. E. McArthur (Penelope Alexander) Currie; 1951-1953, Mr. Leslie Outterson; 1953-1955, Mrs. Paul (Kathleen) Bartlett; 1955-1957, Mrs. Perrin (Anne) Quarles; 1957-1958, Mrs. T. Edward Summerow; 1958-1960, Ms. Thelma Benson. During the 1960s, contests continued to be a central activity of the Club, as was the presentation of annual bowls. A new category of competition began in 1961 when the Anne Quarles Bowl for a Juvenile Story was given to the Club by the former president's daughter, Mrs. Willis (Dit) Henderson. The Wilbe Ormond Trophy was a gift from Mrs. Ormand in memory of her husband; it too was for the children's story. In the summer of 1968, Grant Whitney invited the CWC to host a Writers' tent at the Festival in the Park. Helen Copeland and Charleen Whishnant headed the project, and the tent was staffed in rotation by almost a dozen members. The treasury reached an all-time low of $10.00! In 1969, after John Foster West was guest speaker, the Board voted to suspend payment of speaker. The treasury had reached an all time low point of $10. The president elected for the 1968-1969, Jack Jordan, had to resign mid-term because he was dispatched to the Philipines. Presidents: 1960-1962, Mrs. J.M. (Lou) Guthrie; 1962-1964, Ms. Helen Copeland; 1964-1966, Boyd Blanton; 1966-1968, Ms. Mary Gladys MacGillivray; 1968-1969, Mr. Jack Jordan; 1969-1970, Mr. Jack Binford. SOURCE: This history is based on Dede Wison's article "Charlotte Writers' Club History" that appeared in the 75th anniversary issues of the Club newsletter, Charlotte Writers' Club, May 1997 (Volume 3, Issue 8). The information was reorganized for the web page by Don Mager and Salome Salih El Bey.